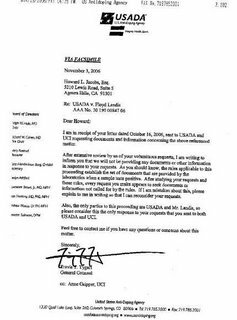 This is Part 1 of a series reviewing correspondence between USADA and Landis. As reported by Landis on DPF and covered here, USADA has denied all requests for more documents in a FAX dated November 3, and reproduced at the right. That means to get anything, Landis will need to make demands to the arbitrators. This position by USADA raises concerns whether they are interested in finding the truth and serving justice, or only in winning! their Case. As we know, the majority of USADA's funding comes from Federal Tax Dollars. Maybe people will be moved to express their opinions about USADA's attitude towards Landis to the congressional leaders providing that funding. I am in receipt of your letter dated October 16, 2006, sent to USADA and UCI requesting documents and information concerning the above reference matter. After extensive review by us of your voluminous requests, I am writing to inform you that we will not be providing any documents or other information in response to your requests. As you should know, the rules applicable to this proceeding establish the set of documents that are provided by the laboratories when a sample tests positive. After studying your requests and those rules, every request you make appears to seek documents or information not called for by the rules. If I am mistaken about this, please explain to me in writing so that I can reconsider your requests. Also, the only parties to this proceeding are USADA and Mr. Landis, so please consider this the only response to your requests that you sent to both USADA and UCI. There are two points to be made. (1) The rules referred to are the ISL, which describes what the lab is required to produce; it does not limit in any way what USADA may produce; (2) this means all of the document requests are going to go before the arbitrators for a decision about relevance prior to hearing. What was in the request that was denied? We shall see in Part 2. All documents presented in this series can be found in the collection at archive.org. Andrew from Australia here. Why not publish the letter from Jacobs to USADA so we can understand the context? Are these documents that Jacobs would only be entitled to in discovery or by subpoena after the Hearing process has commenced? If so, USADA is entitled to deny him documents at this stage. Part 2 of the series is about the document request. Where procedurally it is relevant isn't clear -- subpoena probably isn't in play. The rules are that USADA is supposed to give Landis what they have, if I understand correctly. This includes the LDP as provided by LNDD, and they are not obliged to provide more according to the ISL. If it isn't good enough to make the case, then it isn't. The arbitrators may order more in pre-hearing procedings. It is not at all clear to me under what rule USADA has refused to provide information it has or could obtain. They aren't constrained by the ISL. Seems to me to be the correct response and USADA following their rules and procedures here makes it easier to criticize WADA and LNDD not following the rules and procedures before. You can hardly ask USADA to bend the rules and then complain that someone else didn't follow them. If I were presenting the case I would turn this decision round to my favour. I presume jacobs has demonstrated power of attornery so he should be considered as Floyd in the correspondance. We haven't seen his request letter which may have had so much in it as to be taken as devisive. It good we get to see this as it shows, although to a limited audience, the childish efforts on part of the USADA.